Project based learning is a bit of a Holy Grail in education. The idea is that rather than teaching isolated subjects (which are hard to learn because they have no context to the child) you replace traditional subjects with an immersion in a project that is approached from all angles. Because everything is discovered and taught in context, the ideas are easier to assimilate, and the nature of topic based learning seems to match the way we learn naturally as children - to become obsessed wholly with a particular topic for a period of time. Dinosaurs, Thomas the Tank Engine, Disney Princesses, Pirates, Vehicles and Poo are all subjects which spring to mind when thinking about the recent obsessions of my own and my friend's kids. Up until now we have been not really following a project - just dipping in and out of things which catch the boys attention. Toby recently showed a lot of interest in space and astronauts for example, so we did extra reading around that at bed time, had astronaut colouring, played building rockets out of furniture and looked at a solar system display at a local science centre. At five and a half Ollie has however suddenly decided he wants to know all about mummies (after very intense questioning about the fake one at our local zoo this week). I have been expecting this moment, although unsure when it would come, so fortunately was prepared. I have a great book 'The Children's Illustrated Encyclopaedia of the Ancient World' by Hermes House picked up for £5 from a service station last year ready for just such a moment, plus an unexpected bounty this week of a pop out Hysterical Histories book 'Egyptians and Mummies' from a sale (£1.50 at Tesco), which with additional material from The British Museum's website on Ancient Egypt has given us two days worth of material so far and seems fit to last for at least a few more. 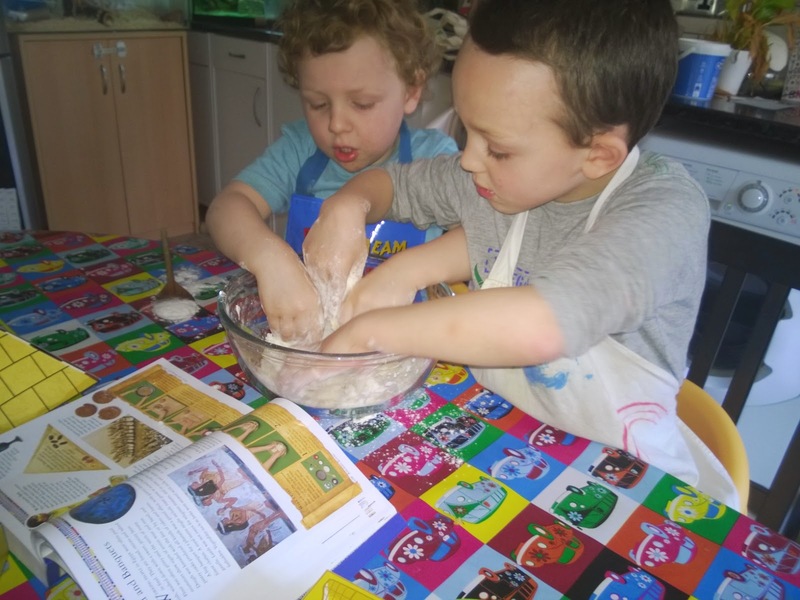 Ollie is using this material to create a project book all about Ancient Egypt, which Toby is starting to lose interest in (apart from mummifying toys which he very much liked) so in order to make him feel included we brought in one of his favourite activities to the project - cooking. The Encyclopaedia has lots of great practical ideas and one of them was a recipe for a honey and caraway seed cake. 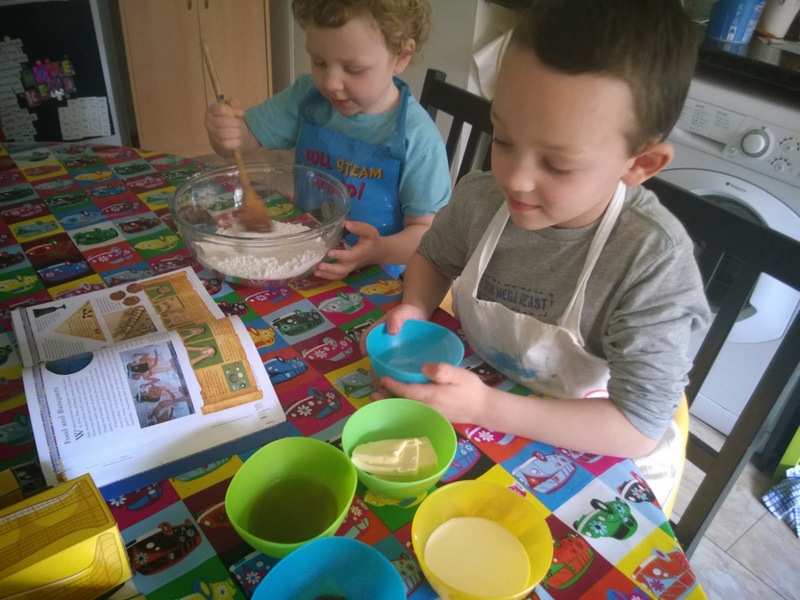 The boys rubbed 75g butter into 200g flour, 1 teaspoon salt and half a teaspoon baking powder. They then stirred in 40g runny honey and 3 tablespoons of milk. 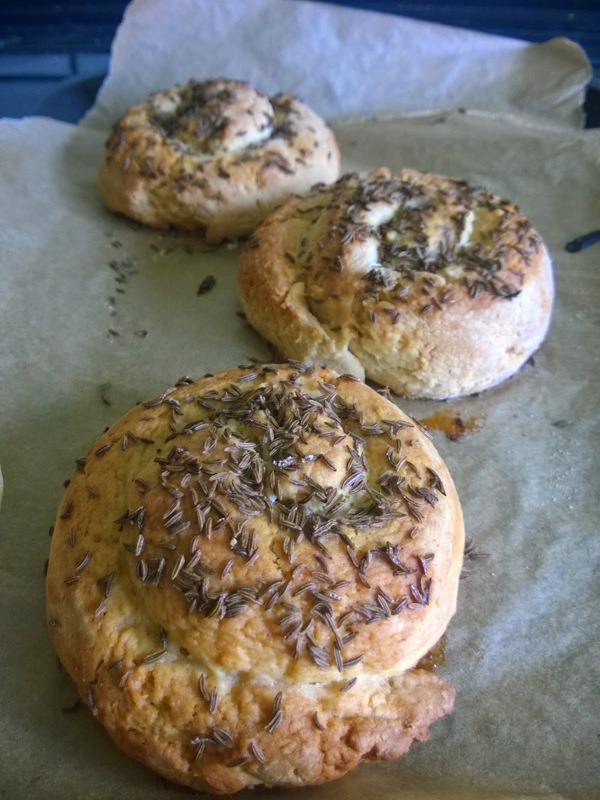 This dough was rolled out into long sausages, coiled up, glazed with more honey and sprinkled with caraway seeds. The cakes were baked at 180C (the recipe said 20 minutes but ours looked fatter so I left them in for 30 minutes). (Vegan friends - try substituting 75ml oil for butter and agave syrup for honey). It will be really fun to find out how ingredients were weighed in Ancient Egypt and make a set of scales for the next time we cook, which will fit in nicely with other maths and science areas of the project. Another part of the project to encourage numeracy skills will be to make an ancient gaming board called a Mehen Board, which hopefully both boys will be able to play (although given Toby's 'I win' attitude to snakes and ladders I'm not entirely convinced this will proceed smoothly). For older kids concepts such as calculating the volume of a pyramid and looking at the geometry and techniques used by the architects are the sort of ways you can use maths in a project format. To describe this project as an obsession is too understated a word. Ollie spent hours sitting down to it yesterday (an occurrence never seen before in this very active child) and it was the first thing he asked to do as he tried to bounce me awake at 6am this morning. 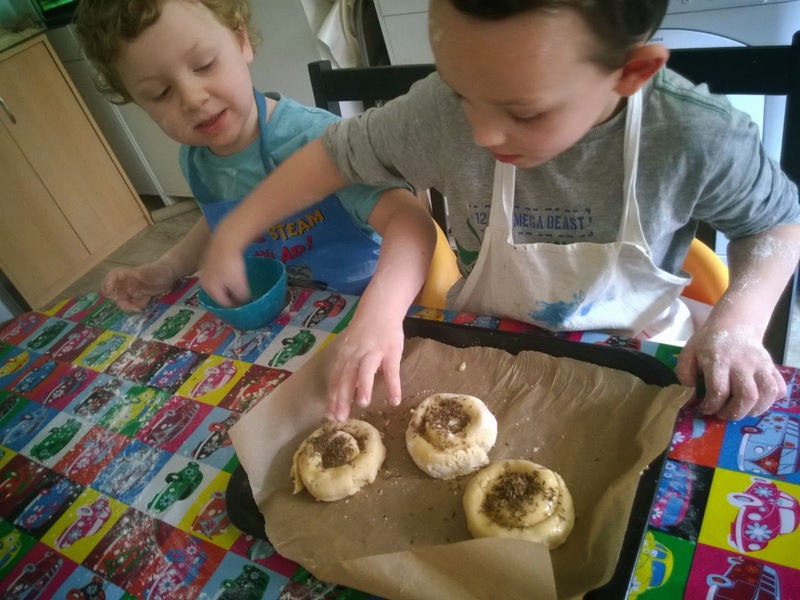 We were thwarted in the end yesterday by using up all three glue sticks, and he pestered all day today to get more glue, satiated only by a morning using the British Museum's website to find out about daily life and cut and paste pictures to print (and of course the baking). Most of the writing is falling to me so far as his 'Royal Scribe', but tomorrow he will be given the task of writing out the recipe we used today and working out how to make twice as much dough. We have touched on Gods and Goddesses, funerary practices and artefacts, food, customs, entertainment, clothes, geography, farming and a host of other ideas to be explored further. Hopefully some time this weekend we will make a water clock with an old plant pot and perhaps attempt to recreate the toy horse on wheels we saw. Eventually we will hopefully get up to London to see the artefacts first hand. 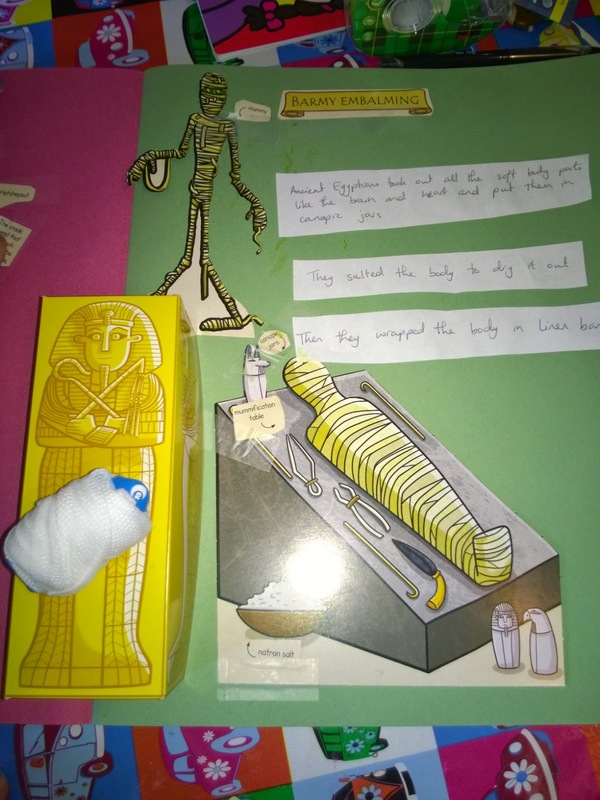 As much as I worry they are somehow disrespectful to the dead I will never forget my own first experiences with seeing genuine artefacts and mummies in a museum in Liverpool when I must have been quite small. So often Matt comes home from work to be told 'we did no school work today' because Ollie hasn't twigged that all the number games and reading and visits to museums are 'school work'. A book to fill in or a worksheet to do are 'work' to Ollie, but making his book - that's just playing isn't it? P.S. 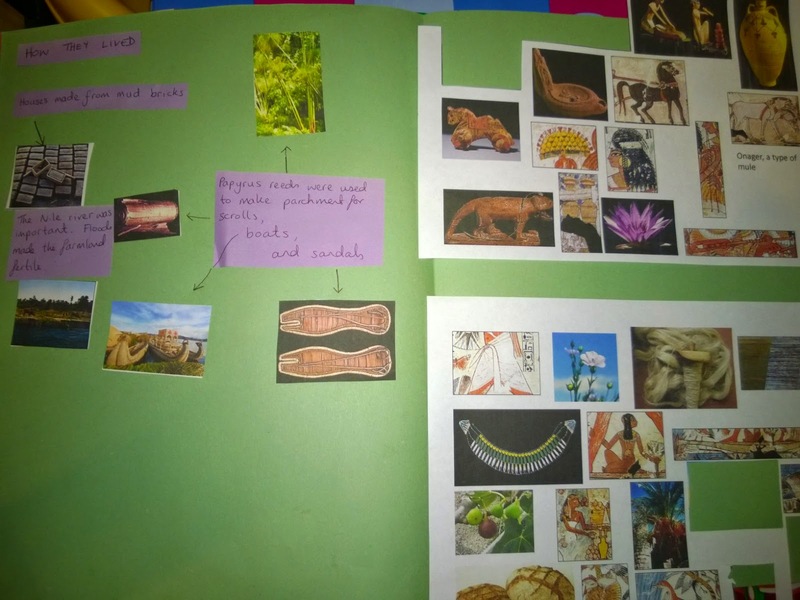 he's planning on making his 'best book ever on ancient Egypt' available to friends to borrow on a three week loan provided they don't draw in it, so it's time to book your slot!